I plan to add 1 quart of honey too...sweeeet! Thanks, Red. I plan to try it out next time we need BBQ sauce. We have discovered the Instant Pot is worth the purchase price even if you only use it for ribs. So, we have been using quite a bit of BBQ sauce lately. Good lord, I never thought. Thanks folks. Like I said it isn't mine but quite good in my opinion. On a side note I used it in my canned pulled/shredded pork and it didn't taste the same as it did just mixed in with the pork before canning. I don't know why but suspect the black pepper and liquid smoke. Also I left out the butter, margarine, oleo, whatever for canning. The product still tasted good but not what I expected. I have 5 or 6 pints left over and plan on canning it without meat this weekend. In a week or two I'll open a jar to taste. Carl the honey sounds great in place of the brown sugar. I'm not sure about the other names, around here the correct name is "Topinambour sunflower" and also used to be known as the "Jewish potato"
Yeah we're talking about the same thing. 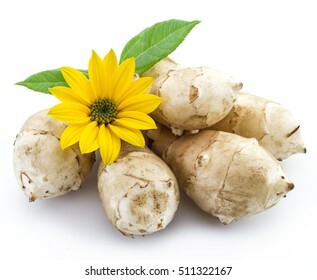 Sunflower with an edible tuber. Ayup. Box is 1 pound, package is 2 pounds. We keep 2 pound packages on hand. Yes on the sauce Red. We used it on pork patties this evening. Good stuff. Ketchup is on sale again in town, so I think I'll do another batch and can it. Pulled the trigger and ordered the excalibur 9 tray dryer Monday. The one with the timer. Should be here tomorrow, barring no oopsies by UPS. No prepping work today. I'm having to take on almost all the housework because wife's illness is getting worse. That means a lot of catching up on it. Her cognitive functions going south and does not good to tell what needs to be done. She forgets really quick. This time, using my lighter reloads, it worked flawlessly. Looks like it doesn't like powerful ammo (or more likely, that my hand movement while shooting those somehow affects the reliable feed of that mag). Yeah I keep the 2 lb. bags on hand. I can only find them in light brown unless I want to pay Kroger or HEB prices. Cool on the pork patties and ketchup. I got 3 24 oz. bottles on the shelf and might get more this weekend if the price is right. DelMonte $0.88 or $0.99 ea. I've been thinking about canning the stuff. With all the vinegar in it water bath canning might be appropriate. I'm going to pressure can the bit I have for 1 hr 15 min. like it was in the shredded pork to see if I get the same taste. Water bath should probably on be for 15 minutes as I've seen in one of my books. Looks like a really nice dehydrator. If/when I get another dehydrator I want one with adjustable temperature and a timer. Planning on drying figs this year if they make well, it isn't looking good. Yesterday I received the O2 absorbers and 20 dz. RM lids I ordered. I'm thinking the same on the water bath canning of it. The mixture is 1/3 apple cider vinegar. The only proven recipes I have are in one of the Fresh Preserving books. Not the so called Blue Book, another, Jams and Jellies I think. Anyway water bath canning seems the way to go. I will try the pressure canning though just to see. Try to get it done tomorrow but could take all weekend. Just have to see what goes down around here. Got our new Excalibur dryer. Giving it a spin with our strawberry's. I got my new Excalibur over the weekend for my bday. Yesterday when I got home from work I decided to just throw in a couple of apples I had at home. Oh my goodness there is so much more room than in my old round one! 5 apples fit on 2 racks! And, at bedtime last night I looked and was in shock at how much faster the process is than in my old one, they will be done by the time I get home from work today... less than 24 hours!! Strawberries did well. 4 trays, 7-1/2 hours. I like the heat setting capability, and the timer. I though about saving 40-50 bucks by getting the non-timer, and going with a separate timer. Wasn't going to save that much, so got the good one. I like how even my excalibur is. Doesn't matter if it is top rack or bottom rack, everything is done the same. Picked up egg noodles and lasagna for the storeroom. I'm trying to fill each tub/container with different dry goods. Once I get them all full, I'll move on to something else. Most are full, or close to full. Various beans other than pinto, navy, and white. I thin we're getting close to a 2 year supply. After this years canning session, we should be close. Got the strawberry's packed in a quart mason. 4 trays full will fill a quart. Wife put in some apples last night, and we got a quart and a half of those. Sounds like you're having fun with your new toy. Well I'm fairly new to canning but leave the fat out, absolutely. I did leave the fat out of what I canned already. I read up on stuff before starting into canning, doesn't mean I know anything so thanks for advising MM. Couple days ago we took a specialist to check out the house we think of buying. He said the old farm buildings on property need a lot of work, but they are all in surprisingly good condition (being at least 120 years old and having zero maintenance since the 1980's). That means the walls aren't cracking, the roofs are not leaking and while the roof beams do have some woodworms in them, it's mainly surface damage and they're mostly ok. Even the old stone cellars are ok, which is good news for possible prepping supplies storage planning. I canned 10 half pints of peppers this morning. That will last me a looonnnnggggg time. Finished up the egg dehydrating and canning this afternoon. Went well. harvested chicken and duck eggs from our coops. milked the diary goats and my dad and my son planted an apple tree. my son is 7 so he loves planting trees. Picked about 6 quarts of strawberries this evening. Second batch we've picked. Back to the Cancer Center to attempt to get chemo as my white cell count was too low last week,bad as I enjoy the ride,I still enjoy some longevity from the meds that I will not have without.